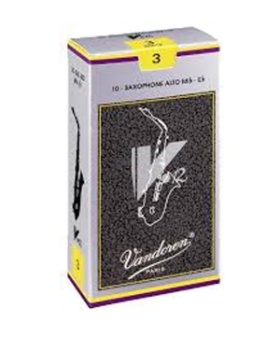 The Success Of V•12 Reeds In The Clarinet World For 25 Years Has Led Us To Transpose Their Characteristics And Advantages Into The Saxophone World. With Its Very Precise Attack, Homogeneous Timbre In Every Register, Controlled High Notes, Warm And Velvety Sound, This New Reed Offers Exceptional Possibilities. Produced From Cane Selected For Its Specific Proportions, The V•12 Reeds Have A Thicker Heel And Are Cut On A Longer Palette With A Slightly Thicker Tip Than The Traditional. The Longer Palette Means That More Of The Reed Is Vibrating, Resulting In A Deeper, Richer Sound. The Thicker Tip Gives Body To The Attack And Also Increases The Longevity Of The Reed.